I though today we could try some m&m brownies. I love m&m’s so why not put them on some chocolate brownies. With this recipe you could made white chocolate brownies. This is a very easy dessert to have. Give this chocolate brownies recipe a try. If you do let me know what you think. If you have a favorite brownie recipe let me know what it is. Let’s get started on making our brownies. So here we go. Lightly grease a rectangular 13x9x2 inch pan. In a 3-quart saucepan, gently combine the semi-sweet chocolate and oil over low heat until melted. Remove from heat and allow to cool. In a separate bowl, combine the sugar, vanilla and eggs until blended. Add in the chocolate mixture. Slowly sift in the remaining dry ingredients and mix until combined. Fold in 1-1/2 cups of m&m’s peanut chocolate candies. Spread the batter into the pan. Sprinkle with the remaining 1/2 cup of candies and press lightly. Bake until the brownies begin to pull away from the sides of the pan, about 30-40 minutes. It’s been cool here this weekend, so i though about some soup! How about some crab soup? Better yet, some easy she-crab soup. Below is a good and simple crab soup recipe. The best is a Maryland crab soup recipe. Try this recipe out and let me know what you think. If you have another crab soup recipe, just let me know what it is. Today, it is illegal to harvest mature female Atlantic Blue Crabs who are pregnant in an effort to keep the declining population stable. Females have a relatively short window to mate-only about once every fifty days or so in the period immediately after they molt. How do the crabbers sort their catch? By examining the patterns on the abdomens of the Atlantic Blue Crabs, referred to as their “aprons.” Here is a handy guide for the seafaring types who prefer to cook up their own fresh catch. (Saltwater slang included). “SOOK” A mature female crab, identifiable by red-tipped claws and apron shape, which resembles a rosy-brown bell or beehive. Many sooks are carrying eggs that are not yet fertilized, and this is where the majority of today’s crab roe comes from. Place carrots, celery, and onion in bowl of food processor. Chop until fine. In medium stockpot, combine milk, stock, cream, Tabasco, Worcestershire, and sherry and bring to a boil. In a separate small stockpot, heat butter until foaming. Add flour and stir about 2-3 minutes. Just until roux is formed. Whisk roux into liquid ingredients until smooth and then add chopped vegetables and crab roe. Cook soup over medium heat until thickened. Add crabmeat and serve in warm bowls. Place crab shells in large stockpot, and add enough water to cover shells. Place over medium heat and cook just below a simmer for 1 hour. Use spoon to skim foam as needed from surface of stock. Do Not Stir. Add bay leaf and continue to cook for 30 minutes. Add salt and remove from heat. Strain through fine-mesh strainer or cheesecloth and cool. * TIP: To obtain crab roe, check with your fishmonger or local specialty food market. Crab roe injects a great deal of seafood flavor and a beautiful yellow hue to any recipe, but be prepared to buy in bulk and reserve extra for future soups and sauces. I though we would try something different. So i though let’s try something in Irish cuisine. Colcannon is good if you like potatoes. It’s a traditional Irish dish consisting of mashed potatoes with kale or cabbage. So here is our colcannon recipe, i hope you enjoy it. So give it a try, and let me know what you think. If you have a favorite Irish dish let me know what it is. Place potatoes on sheet tray in preheated oven and cook until tender; about 1 to 1 1/2 hours. While potatoes cook, heat 2 tablespoons butter in saute pan. Once butter melts, add cabbage and garlic. Cook 2 to 3 minutes or until tender. Deglaze with beer and cook additional 2 minutes. Set aside to cool until potatoes are done. When potatoes are done; cool to room temperature, then peel and shred into large bowl with food processor attachment or food mill. Mix cabbage mixture with potatoes. Add salt. Make well in center of potato/cabbage mixture and sprinkle with flour, using all flour. Place egg and yolks in center of well and, using fork, stir into flour and potatoes (just like making pasta). Once egg is mixed in, bring dough together, kneading gently until ball forms. Knead gently another 4 minutes, until ball is dry to touch. Bring large pot of salted water to boil and generously grease medium bolw with olive oil. Roll baseball-sized ball of dough into 3/4-inch diameter dowels and cut with pastry scraper into small pillows. Drop pieces into boiling water and cook about 1 minute, until floating. Remove with slotted spoon to oiled bowl. Note: Gnocchi can be made ahead. Just place cooked gnocchi immediately in ice bath. Once cool, strain into oil-greased bowl. Place large saute pan over medium-high heat. Add butter. When butter begins to brown, after about 2 minutes, add salt. Increase heat to high and add gnocchi. Cook, stirring occasionally, until gnocchi have heated through, about 1 1/2 minutes. Squeeze lemon over gnocchi and crumble blue cheese. Serve immediately. * An Irish cheddar cheese would also be very nice. With hot, summer weather coming I though we could try a salad recipe. That’s always a nice and cool dish to eat. I think a nice chicken salad is a good choose, don’t you? A salad is nice anytime of the day. The recipe for today is Cool Chicken and Noodle Salad. If you a favorite salad let us know what your choose is. Cook the noodles according to package directions. Rinse under cold water to cool, then toss with the sesame oil. Meanwhile, in a large bowl, whisk together the lime juice, brown sugar, chili (if using), 1/2 tsp. salt and 1/4 tsp. pepper. Add the apple, cucumber and scallions to the lime juice mixture and toss to coat. Slice or shred the chicken, discarding the bones. Add to the apple-cucumber mixture and toss to combine. Add the noodles and mint and toss again. You cannot beat a good tasting stew. So i though we could cook oyster stew. 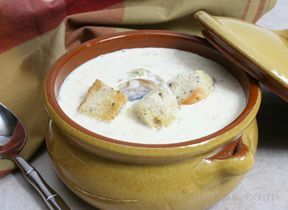 With winter coming to an end, why not come up with a good oyster stew recipe. I think i’ve found the perfect stew recipe, for the end of winter. After your tried this classic recipe, please let me know what you think of it. If you have a favorite stew and/or oyster stew recipe let me know what it is. Drain oysters, reserving oyster liquor (about 1 cup). Heat milk and oyster liquor in a small saucepan over medium heat, whisking occasionally to prevent scorching, 3 to 4 minutes or until ixture,just begins to steam. Add oysters, and season with desired amount of salt and pepper. Cook 4 to 5 minutes or until the edges of the oysters just begin to curl. Remove pan from heat. Using a slotted spoon, transfer oysters to a plate to prevent them from overcooking. Melt butter in a large saucepan over medium heat. Add shallot and garlic, and cook, stirring often, 4 minutes or until tender. Sprinkle flour over shallot mixture, and cook, whisking constantly, 1 to 2 minutes or until completely incorporated and bubbly. Gradually whisk in half-and-half and next 3 ingredients. Bring to a boil, whisking constantly. Gradually stir in reserved milk mixture and oysters. Reduce heat to medium-low, and cook stirring occasionally, just until warmed through. Season to taste with salt, pepper, lemon juice, and hot sauce. Serve with crackers. Just about everyone enjoys chicken, right? So today i though we could try a fried chicken recipe. 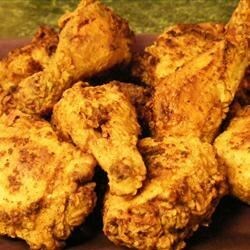 The chicken recipe we are using today is a deep fried chicken recipe with buttermilk. The kicker is its a spicy fried chicken recipe. I though it was time for a good fried chicken recipe. After trying this recipe let me know what you think about it. Also if anyone has a good fried chicken recipe, please let me know. I would love to try it and post it. Let’s get started. Mix salt, garlic powder, chili powder, sage, pepper and cayenne in a small bowl. Rinse chicken and pat dry. Place in a single layer in a baking dish. Use about 1/3 of the salt-spice mixture to rub into all the chicken pieces. Let the chicken dry brine in the refrigerator (uncovered) for an hour or two. Season the flour 1 1/2teaspoons of the remaining salt-spice mixture in a shallow dish, mix buttermilk, egg, 1 teaspoon of the remaining salt-spice mixture and hot sauce to taste. Working with one piece at a time, dip chicken into flour mixture to coat well. Shake off excess. Dip into buttermilk to coat; let excess drain back into bowl. Dip chicken again into the flour mixture to coat on all sides; shake off excess. Place coated chicken on a rack set over a tray and refrigerate uncovered up to several hours. Let chicken stand at room temperature while you heat the oil or up to 1 hour if it’s not to hot in the kitchen. About 30 minutes before serving, heat oven to 200 degrees F. Have a baking sheet topped with a wire cooling rack ready. To fry, gently slip a couple of pieces of chicken into the oil. Do not crowd the pan. Cook, turning gently with tongs after 5 minutes, until chicken is deep-golden and meat feels firm when pressed (165 degrees F on an instant-read thermometer), usually 10 minutes total. Transfer to the rack; place in the oven while you fry the rest of the chicken. To serve, arrange chicken on a heated platter. Drizzle generously with the glaze. Serve hot with extra glaze for dipping. After frying, let the oil cool, then strain it through a fine wire mesh sleve into a glasscontainer. Refrigerate covered up to 2 weeks and use for other frying, browning or sauteing purposes. Note: Bone-in, skin-on chicken breasts can stand in for the chicken legs. Increase cooking time to about 12 minutes. Use caution not to overcook. To reheat the chicken, put it on a wire rack set over a baking sheet. Bake in a 400-degree F. oven for a few minutes. Rewarm the glaze before drizzling it over the chicken. If you want a spicier result closer to Nashville’s hot chicken , double the amount of salt-spice mix when coating the chicken pieces. Leftover salt-spice mixture will keep in a covered container for several weeks; it is great rubbed into chicken or pork chops before roasting or grilling. Mix everything in a small saucepan. Heat over medium until warm and salt has dissolved. Serve warm. Note: Use warm dipping sauce to glaze fried chicken, dunk biscuits or oven roasted Brussels sprouts or sweet potatoes. No agave? Make a simple syrup by boiling 1 cup sugar with 1 cup water until the sugar is completely dissolved and let cool. Store this sauce in the refrigerator up to 2 weeks. I though today we would try some vegetarian chili. 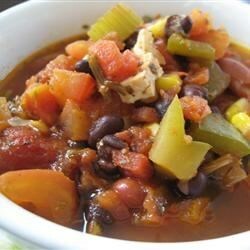 I know their are a lot of vegetarians out there, and many vegetarian chili recipe. I think the chili today is an easy vegetarian chili to make. Does anyone have a favorite vegetarian chili recipe? If so please, let us know about it. Please post the recipe for our other readers to see and try. Heat a dutch oven or large saucepan over medium-high heat. Add oil, garlic, onion and bell pepper; cook for 4 minutes. Add cumin; cook, stirring, until cumin coats vegetable mixture, about 30 seconds. Stir in 1 cup water and all remaining ingredients with 1 tsp. salt and 1/2 tsp. pepper. Bring to a boil. Cover, reduce heat and simmer for 5 minutes. Stir mashed beans into chili. Simmer 5 more minutes. How is everybody doing today? I hope you’re having a pleasant Sunday afternoon, I know I am. Today we’re going to try our hand at some Italian soup. I have an Italian suit recipe I’m going to try today. Do you have a favorite Italian soup recipe? If so let us know we would love to try it. Today we’re going to prepare lasagna soup insalata. Preheat large stock pot 2-3 minutes on medium-high. Brown sausage 5- 7 minutes, stirring to crumble meat, or until no pink remains. Chop carrots. Stir carrots and onions, peppers and celery into sausage; cook and stir 4 minutes. Reduce heat on pan to medium-low. Stir in pasta sauce, broth and pesto; simmer 8- 10 minutes, stirring occasionally, or until hot. Stir pasta into soup; cook 4-5 minutes are until pasta is tender. Meanwhile, chopped salad greens. I hope everyone’s having a great Sunday afternoon. I know it’s cold and snowy where I am. Just sitting here writing, and waiting for the heavy snow to start. This appetizer, goat cheese trio, can be put together fast in about 5 minutes or so. It requires no oven cooking space, and is always a sure- fire hit. That’s why it’s a must on your Thanksgiving appetizer recipes list. Also a must on your appetizer party recipes list. Finally a must own just in the appetizer recipes list. Before we get started, what are some of your favorite hors d’oeuvres you like to prepare? Please let us know what these may be. Also what are some of your favorite ingredients that you like to cook with it? And finally watered some of your ideas on different cooking situations? Keep all 3 of these questions in mind, and let me in our readers know what your answers are on the 3 topics. Mix together the Italian parsley thyme leaves and Rosemary leaves. Next, take one of your goat cheese logs and rollover your mixed herbs. Then take another goat cheese log in rollover the mixed peppercorns. Finally take the 3rd and last goat cheese log, mix together your dried cranberries and cashews, then take the goat cheese log in rollover the mixture. Serve warm baguette slices or crackers. I thought today we can have something in t9he category of winter comfort foods. Today we are going to fix harissa-spiced cassoulet. I know a lot of people who like North African foods, and North African food traditions. Harissa is one of many North African food recipes. 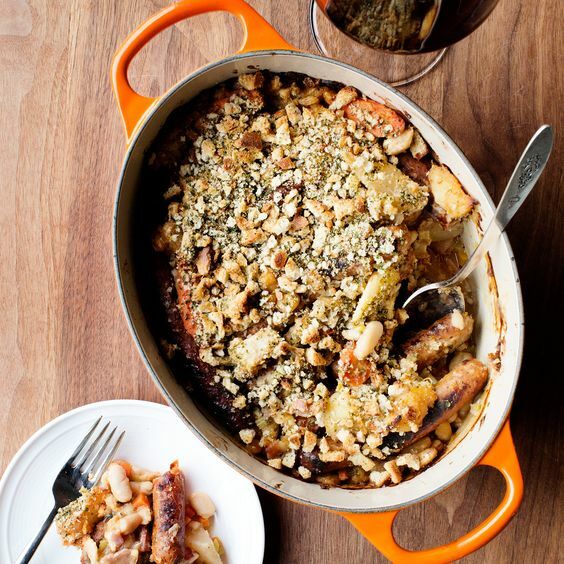 Cassoulet is a rich, slow- cooked casserole originating in the South of France, containing meat (typically pork sausages, goose, duck and sometimes mutton), port skin (couennes) and white beans (haricots blancs). The dish is named after its traditional cooking vessel, the casserole, a deep, round, earthenware pot with slanting sides. Meanwhile, preheat the oven 350 degrees F. In a small skillet, toast the cumin, coriander and mustard seeds over moderate heat, shaking the pan, until fragrant and the mustard seeds begin to pop, 3 to 5 minutes. Transfer to a spice grinder and let let cool. Add the smoked paprika and crushed red pepper and grind the harissa blend into powder. Add the sweet potatoes, turnips and large carrots to the casserole. Season with salt and black pepper and cook over moderately high heat, stirring occasionally, until the vegetables begin to soften, about 5 minutes. Add the harissa spice blend and cook until fragrant, about 2 minutes. Stir in the bean mixture and the reserved 2 cups of cooking liquid and bring just to a simmer. Arrange the merguez on top. Cover and bake the cassoulet for about 1 hour, until the beans are tender and most of the liquid has been absorbed. Remove fro the oven and uncover the cassoulet. Preheat the broiler. in a bowl, toss the bread, parsley, lemon zest and the remaining 3 tablespoons of olive oil; season with salt and black pepper. Sprinkle the bread over the cassoulet and broil until golden and crisp. Let the cassoulet stand for 10 minutes before serving. Pass yogurt at the table. Hope everyone is having fantastic fall day, I know I am. Today we’re going to try and it cooking something healthy. Today we’re going to prepare a shrimp zucchini recipe. So I hope everyone likes shrimp and zucchini. The shrimp zucchini stir fry recipe we are using has only around 415 calories. The zucchini we are using is a summer squash, and is one of our vegetables we are using in this recipe. Zucchini is cooked and presented as a savory dish or an accompaniment. Today we are using it as an accompaniment. Shrimp is high in calcium, iodine and protein. Shrimp is also a significant source of cholesterol, the amount depending on the method of preparation. Shrimp consumption is considered healthy for the circulatory system because of the lack of significant levels of saturated fat in shrimp means that the high cholesterol content in shrimp actually improves the ratio of LDL to HDL cholesterol and lowers triglycerides. Reheat rice as label directs. Let cool. In 12 inch skillet, heat 1 tablespoon oil on medium-high until hot. Add shrimp to skillet; sprinkle with 1/8 teaspoon freshly ground black pepper. Cook 2 minutes are until almost opaque throughout, stirring occasionally. Add 1 tablespoon maple syrup. Cook 1 minute or until shrimp is opaque throughout. With slotted spoon, transfer to medium bowl. To same skillet, and zucchini; cook 2 minutes, stirring occasionally. And remaining 1 tablespoon maple syrup and 1/2 teaspoon soy sauce. Add 2 tablespoons water if pan is dry. Cook 4 to 6 minutes are until zucchini is tender, stirring and scraping up any browned bits. Transfer zucchini and any juices to bowl with shrimp. To same skillet, and green onions, ginger, and remaining tablespoon oil. Reduce heat to medium. Cook 1 minute, stirring. Add rice, remaining 1 1/2 teaspoons soy sauce, and 1/8 teaspoon salt. Cook 3 minutes are until rice is hot, stirring constantly. Serve rice with shrimp. Hope, everyone is having a great fall day. We are slowly heading towards winter, and that means cold temperatures. That also means it’s chicken soup time! Today I thought we would make a chicken tortilla soup. This chicken tortilla soup recipe is made in approximately one hour and 30 minutes. It’s well worth the time spent on this great recipe. Our chicken tortilla soup using tomato paste is a great spin, to his already fabulous recipe. After you have tried today’s recipe. Let me know whether you like or dislike to soup. So if everyone’s ready, we’ll get started with today’s recipe. Heat oven to 350°F. Arrange the chicken on 2 large foil-lined rimmed baking sheets. Drizzle with 2 tablespoons of the olive oil and liberally sprinkle with salt and pepper. Roast until cooked through, 20 to 25 minutes; set aside to cool. Once cool, remove the skin and shred with tuning forks or break roughly into small pieces by hand. Set aside. Heat the remaining 4 tablespoons of oil in a stockpot. Add the onions and sauté until soft, about 7 minutes. Stir in the cumin, chili powder, and red pepper flakes and cook until aromatic, about 5 minutes. Add the garlic, peppers, and carrots and stir to combine. Cook until the carrots began to soften, about 15 minutes. Add the tomato paste and the cooked chicken; stir to coat. Add the broth, beans, tomatoes and juice, and bay leaves; cover and bring to a boil. Reduce heat and simmer for 15 minutes. Remove bay leaves. Season with salt and pepper. To serve: Include one quarter of the tortillas, cheese avocado limes and cilantro. Reheat the soup and ladle into bowls. Slice the tortillas into thin strips and divide among the bowls. Top with crumbled cheese, diced avocado, a squeeze of lime, and cilantro leaves. This is our end of summer series finale. I thought everyone would enjoy a nice steak recipe, for our end of summer meal. Stake grilling is an art, it’s like anything you grill. It takes a lot of practice using a grill. When grilling, you need a clean grilling surface, this a long with a hot grill reduces the chance of your food sticking. I hope everyone had a very pleasant summer. It’s unfortunately coming to an end. If you have any questions, are a comment please let me know. Let’s get started with our last recipe of the summer. Combine the tomatoes, anchovies, parsley, garlic, 3 tablespoons of the oil, and 1/4 teaspoon each salt and pepper in a medium bowl. Season the steaks with 1/2 teaspoon each salt and pepper. Grill until an instant- read thermometer inserted into the center of each steak registers 130°F, 2 to 3 minutes per side for medium rare. Let rest for 5 minutes before slicing. Rub the bread with the remaining tablespoon of oil. Grill until golden brown, 1 to 2 minutes per side. Here we go with a 3rd installment, of our end of summer series. Today will be preparing the Indian and Scottish dish, chicken takka masala with rice. If you like spicy dishes, this recipe you’ll love. You can control how much heat, that you have with this dish. There are many ways to cook chicken tikka masala. If you like you can make, chicken tikka masals. There are many Indian chicken tikka masala recipes, out there. You can also fix, vegetarian chicken tikka masala. Chicken tikka masala is chicken tikka, chunks of chicken marinated in spices and yogurt (optional), the recipe below does not have yogurt.in it, that is then baked in a tandoor oven, and served in a masala (spice mix) sauce. I tomato and coriander sauce is common, but there is no standard recipe for chicken tikka masala; a survey found that, the only ingredient, found to be common was chicken. The sauce usually includes tomatoes (frequently as purée), cream, coconut cream in various purée. 1. Preheat 4-quart saucepan on medium-high. Place 1 tablespoon oil in pan, then add rice, cook and stir 1 minute. Add water and salt; bring to a ball. Reduce heat to low and cover; simmer 18- 20 minutes are until water is absorbed and rice is tender. 2. Preheat large, nonstick sauté pan on medium-high, 2-3 minutes. (Cut tenders into halves or thirds, if desired.) Place remaining 1 tablespoon oil in pan then add chicken; cook 4-6 minutes, turning occasionally, or until browned. Add vegetables; cook and stir 3 minutes. 3. Reduce heat to low. Add tikka sauce and pepper flakes, then cover; simmer 4-5 minutes, stirring occasionally, or until chicken is 165°F. Meanwhile, chopped cilantro. This is our 3rd installment of our end of the summer cooking series. Today we are making strawberry and chocolate chip iceberg cake. You can’t get any better than having fresh fruit to go along with your icebox cake. There are very few ingredients that go with this icebox cake recipe. If you’re having a cookout, are a family get-together will. You are better off preparing this one or 2 days ahead. This way your cake has plenty of time to to set up. By doing this, your guest will want more and more of this delicious cake. Let me know how much you have enjoyed strawberry and chocolate chip icebox cake. Don’t forget in the coming weeks I will be having a new cookbook coming out. If you would like to preorder let me know. I will be more than glad to hold the cookbook for you. 1. In a large bowl, with mixer on high speed, beat 2 cups heavy cream 3 minutes are until stiff peaks just form. In another large bowl, with mixer on medium high speed, beat cream cheese, sugar, and remaining 1/2 cup heavy cream 1 minute are until smooth, scraping down ball as needed. Using a rubber spatula, fold whipped cream and cream cheese mixture together until combined. 2. Trace 8 inch circle on parchment; cut out and invert onto serving plate. Arrange 7 (3 inch) are 13 (2 inch) chocolate chip cookies on parchment to fill circle. Top with heaping 1 cup cream mixture and 2/3 cup chopped strawberries. Repeat with remaining cookies, to make 6 layers, ending with cookies. Wrap cake with plastic wrap and chill 6 hours or overnight or until set. (Refrigerate remaining cream mixture until ready to serve). 3. To serve, stir reserve cream mixture to loosen. Unwrap cake, spread cream mixture on top, and garnish with strawberry halves. We are continuing our series of summertime recipes. 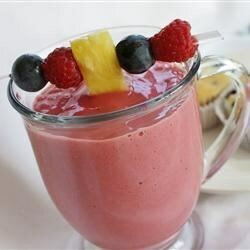 Today’s tasty recipe is banana berry smoothie. I think Everone likes some type of smoothie, all you have to do is change the ingredients. There are all types of smoothie recipes, that can be found today. Smoothies are great anytime of the day. The good thing about smoothies, you can use fresh or frozen fruit. They are quick and very easy to prepare. In the coming weeks my new book will be coming out. I will let everyone know when it’s ready. 1. In a blender, and all ingredients. 2. Puree all of the ingredients, blend together until smooth. Today we are continuing with our summer theme of recipes, to both eat and drink. Today we are going to make something with a Latin American twist. Today’s recipe is called mixed berries ceviche. Today’s ceviche recipe is a very quick and easy recipe to follow, it takes only 20 minutes time. More to the point,about today’s recipe. It’s a ceviche shrimp recipe made with fresh gulf shrimp. Ceviche is a seafood dish popular in the coastal regions of Latin America. There are variations found in other nations including the United States. Any ceviche dish can be made a main course or an appetizer. 1. in large bowl, whisk together lime juice, mint, oil, vinegar, coriander, red pepper, sugar, and 1/4 teaspoon salt. 2. Add shrimp, avocado, cucumber, strawberries, blueberries and red onion; vote until well combined. 3. Can be made up to 2 hours ahead; cover and refrigerate. Serve ceviche with tortilla chips. The summer recipe that I promised you the other day, is going to be chicken kebabs when yogurt-lime marinade. The chicken kebabs recipe is a heart conscious recipe. I wanted to find a very healthy recipe so I settled on this chicken kebabs recipe. So I hope you, enjoy this simple but tasty, recipe. After you have tried this chicken recipe, let me know what you think. If you have a question, comment, I just want to say hey, leave a, comment and I will get back to you. 1. Combine garlic, ginger, turmeric, lime juice, yogurt, salt and black pepper in a large freezer bag. Add chicken cubes to bag and seal the bag, massaging to coat. Refrigerate at least 1 hour, or preferably overnight. 2. Thread chicken cubes and zucchini rounds on metal skewers. Prepare grill surface with nonstick cooking spray and heat grill to medium-high heat. Grill until chicken is cooked through and zucchini is tender, turning skewers occasionally, about 10 to 15 minutes. These chicken kebabs get their great taste from a citrusy yogurt marinade. Serve with fresh herbs like mint, basil, tarragon, and cilantro plus extra plain yogurt and lime-wedges. Today we are going to do some canning. We are going to make dill pickles. This is a very easy and straightforward dill pickle recipe. My wife and I have been canning and preserving all summer. We will continue canning and preserving into the fall. One good thing about having a dill pickle. Is you can use the dill pickle juice after you have eaten all of the dill pickles. You can pickle, eggs onions just about anything you would like with this leftover juice. After you have tried this recipe let me know what you think. 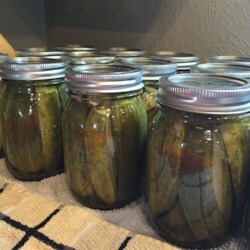 Write and tell me if you like, are don’t like this dill pickle recipe. Let’s get started! 1. Prepare stockpot/canner in jars as directed in step-by-step instructions. 2. Tie pickling spice in a square of cheese cloth, creating a spice bag. 3. Combine vinegar, water, sugar, pickling salt and spice bag in a medium stainless steel saucepan. Bring to a boil over medium-high heat, stirring to dissolve sugar and salt. Reduce heat and bowl gently for 15 minutes, until spices have infused the liquid. 4. Place one Bay leaf, 1 garlic clove, half teaspoon mustard seeds and 1 head of dill into each jar. Pack cucumber slices into hot jars, leaving 1/2 inch headspace. Add rounded 1/8 tablespoon pickle crisp granules. Ladle hot pickling liquid into jars, leaving 1/2 inch headspace. Remove air bubbles; re-measure headspace. If needed, add more cucumbers to meet recommended headspace. Wipe rim; center lid on jar. Through band until finger-tip tight. 5. Process filled jars in boiling water for 15 minutes. Remove stockpot lid. Wait 5 minutes, then remove jars, cool and store. Today I’m going to show you how to prepare slow cooker chili dogs. You can prepare this chili dogs recipe any time. It taste good summer, fall, winter and spring. I think just about everyone likes a good chili dog. Chili dogs are good for a large crowd or for a small get together. This is a good to know easy recipe to follow. Let me know if you enjoy this recipe, also if you don’t like it as well. 1. Place it tomatoes and there juices in a 5- to 6- quart slow cooker, breaking them up with your hands as you add them. Stir in the chili powder, cumin, all but 3 tablespoons of the onion and 1/2 teaspoon pepper; refrigerate the remaining red onion. 2. Add the beef, break it up and stir to combine. Cook, covered, until the meat is cooked through and liquid begins to evaporate, 5 to 7 hours on low or 3 to 4 hours on high. 3. 15 minutes before serving, add the hot dogs to the slow cooker and cook, covered, until heated through. Divide the hot dogs among the buns and top with the chili, cheddar and remaining onion. Serve with pickles, if desired.